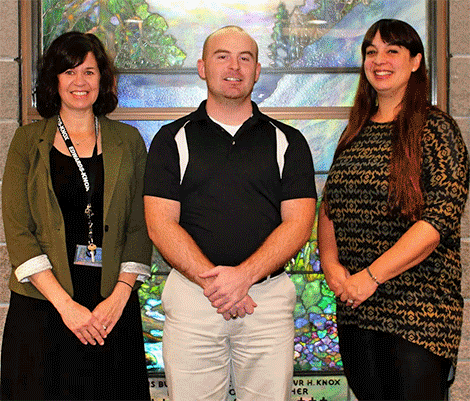 Kelly Cusano, Shane Pickering and Tomorrah Averill have been named master teachers. EDWARDS -- Three Edwards-Knox Central instructors have been named master teachers by the governor's office. Kelly Cusano, Shane Pickering and Tomorrah Averill received the designation. Cusano lives in Ogdensburg and has taught at the district for 25 years. Pickering is a Gouverneur resident and has worked there for three years. Averill lives in DeGrasse and has been at E-K for eight years. The master teacher program recognizes those teaching at least 60 percent STEM disciplines (science, technology, engineering and math). It is not open to those who mainly teach languages, humanities, social science, music or art. Master teachers each receive a $15,000 annual stipend for four years. They also “engage in peer mentoring and intensive content-oriented professional development opportunities throughout the academic year” and "work closely with pre-service and early career teachers to foster a supportive environment for the next generation of STEM teachers,” according to SUNY. They also “attend required regular cohort meetings, participate in and lead several professional development sessions each year, and participate in the training of pre-service and early career educators as part of the master teacher program,” SUNY said. Those recognized as master teachers apply for it. They must have taught STEM for at least four years in a New York state school, have a teaching load of at least 60 percent STEM classes and rate either effective or highly effective on the state teacher grading system.